Peggle is an arcade puzzle game, released in 2007, that was developed and published by PopCap Games. Given the cartoony artwork on the cover of the game’s jewel case, it almost looks like one of those games that used to be sold as a gateway for getting a user to try America Online or to install a Yahoo! Toolbar. I was concerned when I installed it on my machine that I might have to uninstall some unsavory software. 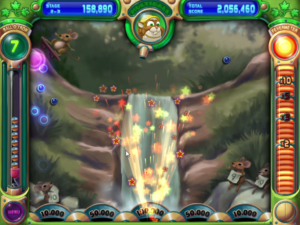 I am glad I did install Peggle as it not only seems like a safe stand-alone piece of software, but it is actually a very fun, addictive game. The objective of the game is to eliminate all of the orange pieces prior to running out of balls. 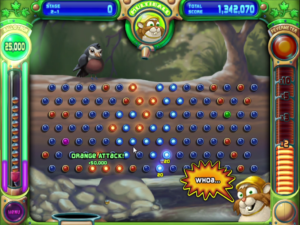 Once all of the orange pieces are eliminated, the player progresses to the next level. The player controls the direction in which a ball is launched. The ball then bounces off of every surface it hits in Plinko fashion until it falls down through the play field. At the base of the play field is a ball catcher that oscillates to and fro. If the ball is caught by the ball catcher, the player is awarded an extra ball to use in play. Otherwise, the ball is lost, and the player fires another ball to attempt to eliminate the orange pieces. There are also blue, purple, and green pieces. Blue pieces are the standard default pieces. They award a set number of points when hit, but do not contain any special properties. Purple pieces award increased bonus points. 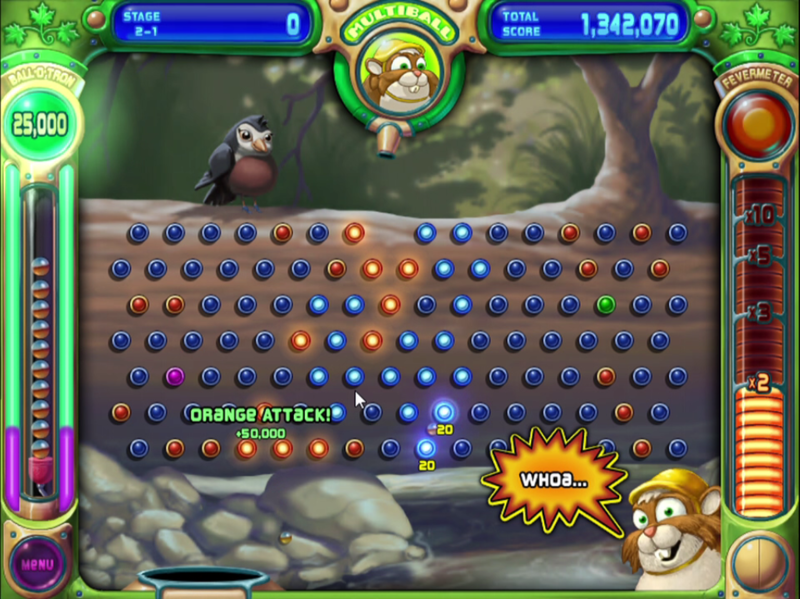 Green pieces cause special actions to occur based on the host mascot of the particular stage of levels being played. There appear to be 50 levels divided into five level stages. Each five level stage is hosted by a particular animal mascot, or master. The first stage is hosted by Bjorn the Unicorn. When a green piece is hit in Bjorn’s levels, the player is awarded a “Super Glide” for the next three balls. Super Glide allows the player to target a piece and then target where the ball will ricochet into another piece. The second stage is hosted by Jimmy Lightning, who appears to be a hamster on a skateboard. 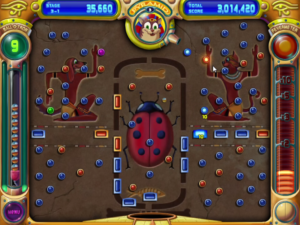 Hitting a green piece in his levels spawns a second ball that bounces in the opposite direction of the ball that hit the green piece. If timed correctly, this can cause the player to catch both balls. The third stage is hosted by Kat Tut. 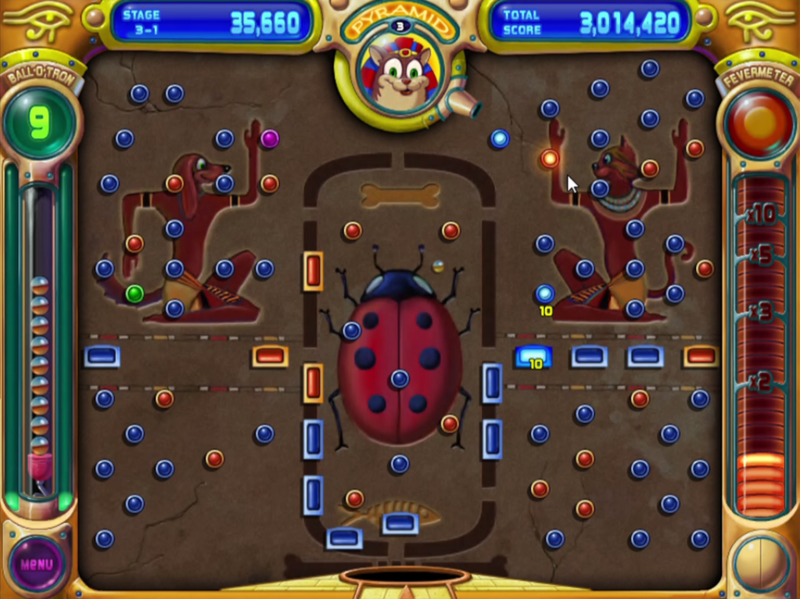 When a green piece is hit, the ball catcher turns into a pyramid for five turns. When this happens the player’s ball has a better chance of bouncing away from falling into the abyss and instead making it into the ball catcher for a free ball. I’ll need to play further to explore the other level stages. 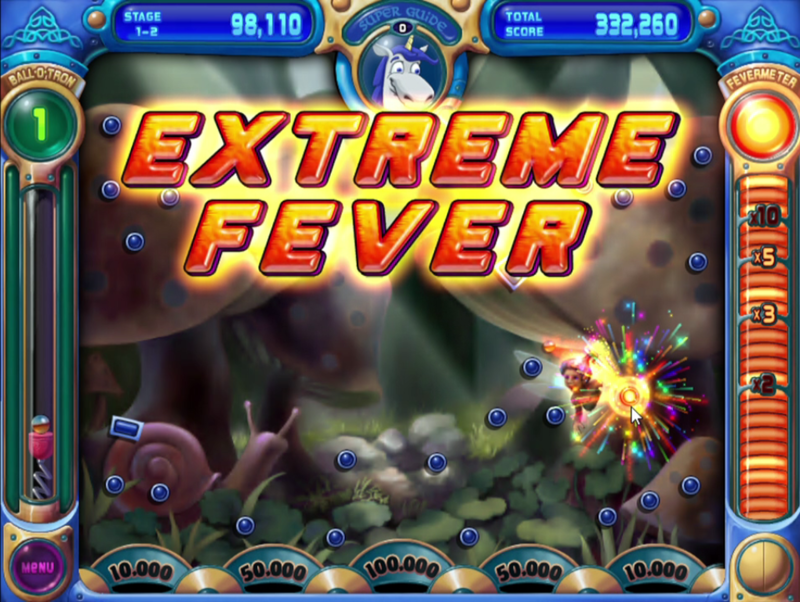 When the final orange ball is hit, the game enters “Extreme Fever” mode. 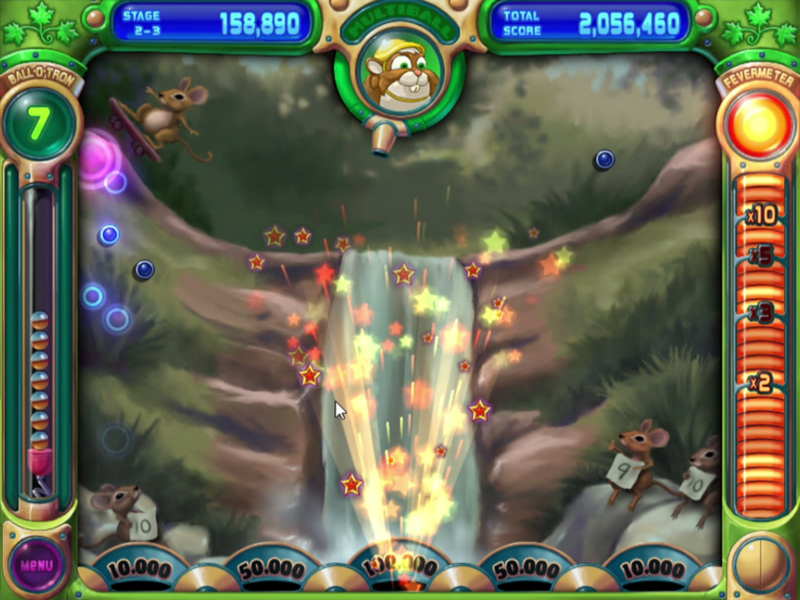 Gameplay enters slow motion and rainbow sparks fly to the background music of “Ode to Joy” from Beethoven’s symphony number 9. The ball then bounces into one of five containers at the base of the play field for bonus points. The middle container is worth 100,000 points, those on either side of it are worth 50,000, and the final containers are worth 10,000 points. 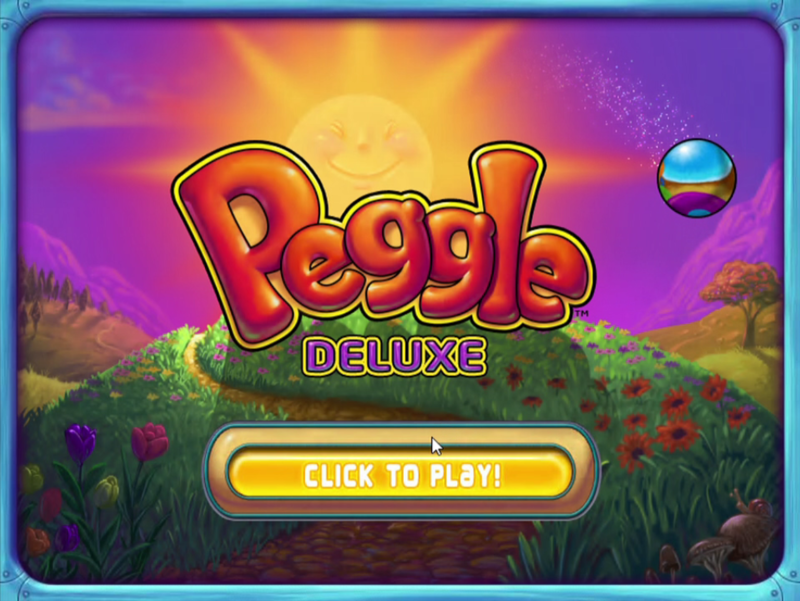 Peggle hits all the right stimuli to keep you playing. Flashy graphics, encouraging cute fuzzy characters, and catchy sounds and music all combine to keep a player focused on shooting another ball onto the play field and getting to the next level. I had meant to review a different game tonight. When it didn’t work on Windows 10, Peggle was my fall back. Even though it was late, I couldn’t stop clicking and wanting to play that next level and watch my score go up and up. This game will eat your time. If you didn’t have anything too important going on, you’ll be glad it did. 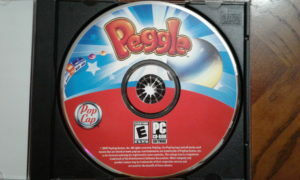 I purchased my copy of Peggle second hand still in shrink wrap from either a thrift store or a yard sale. The price was right, so I grabbed it. 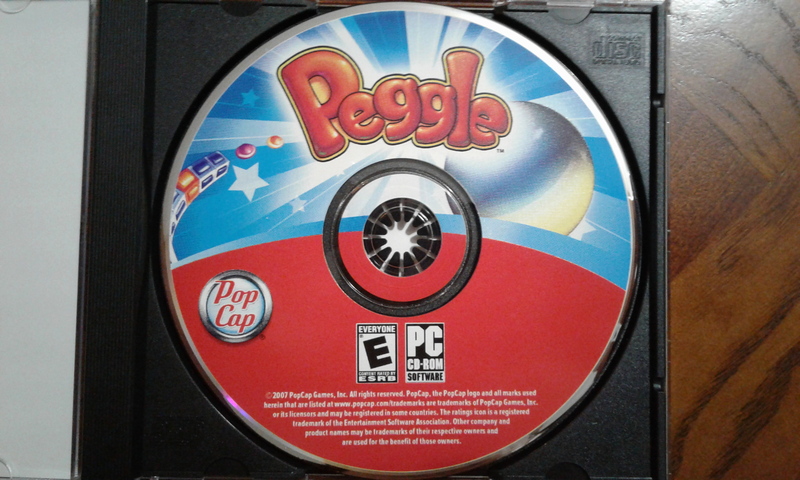 However, Peggle also came out on the Steam platform. At the time this article was published, it could be purchased for $4.99. It’s not the the most challenging puzzle game out there. I would actually consider it more of an arcade game than a puzzle game, but it is a virtual dopamine factory with its visuals and sound. This would also be a good title for small children as it is easy and avoids frustrating the player at its lowest levels.